Carlos Bautista is from Bogotá, Colombia. He was born on the 27th of July of 1981. He holds a bachelor degree in Industrial Design from Javeriana University. He has academic experience being an Industrial Design professor for different Universities is his country. He is an entrepreneur and has worked in different projects related to design with social impact. During the past two years he has been doing research trying to find a solution for the antipersonnel mines problem that is afflicting his country. He gained the third Prize, NYC Media Lab Annual Summit, AR-APM (Augmented Antipersonnel Mines) Research Project. Also he has supported student teams in providing guidance and resources for ideation and prototyping and run various workshops for the NYU community as an active leader of the DFA (Design For America) of NYU. I would first like to thank my thesis advisor Professor Claudio Silva of the Tandon School of Engineering/Computer Science department at NYU. The door to Prof. Silva office was always open whenever I ran into a trouble spot or had a question about my research or writing. I would also like to thank the experts who were involved in the research phase of this research project: Professor Mark Skwarek, Professor Dana Karwas, Professor Charles Downs and Co-Director and an Industry Associate Professor of Integrated Digital Media DeAngela Duff. Without their passionate participation and input, the research phase could not have been successfully conducted. I would also like to acknowledge Professor Anne Laure Fayard of the Department of Technology Management and Innovation at NYU as the second reader of this thesis, and I am gratefully indebted to her for her very valuable comments on this thesis. 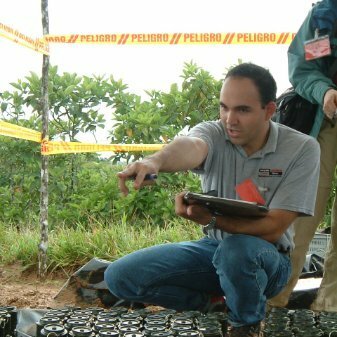 I would also like to thank to The Directorate for Comprehensive Action against Antipersonnel Mines and their Scientific and Technical Committee headed by Professor Diego Alejandro Torres Galindo who has been an invaluable partner throughout this process. Finally, I must express my very profound gratitude to my parents, my parents in law and to my wife Andrea Dávila for providing me with unfailing support and continuous encouragement throughout my years of study and through the process of researching and writing this thesis. This accomplishment would not have been possible without them. Thank you. This thesis is dedicated to Andrea Davila who has been a constant source of support and encouragement during the challenges of graduate school and life. I am very grateful to have you in my life. This work is also dedicated to people in Colombia who have been victims of armed conflict and hope like me, living in a reconciled country. During this week I had my weekly meeting with Claudio Silva and we discussed about how to do user testing for mobile apps. I showed him an IOS app based on MapBox able to follow user’s position. Landmines are certainly a huge issue in countries affected by armed conflict due to the fact that can remain active for over 50 years after the conflict’s end. This issue has been addressed so far by developing technologies focused on military technology, largely due to the fact that they are the most affected by this scourge in a scenario of armed conflict. Yet, it is important to note that the civilian population is also being affected and the numbers may lean toward them at an accelerated rate in a scenario of post conflict. Technologies for mobile development, Information collection methods for GPS Devices and Information Visualization are some of the available options to mitigate the problem. Moreover, the access to reliable information about clearance processes is key to avoid the damages by Anti-personnel Mines casualties. 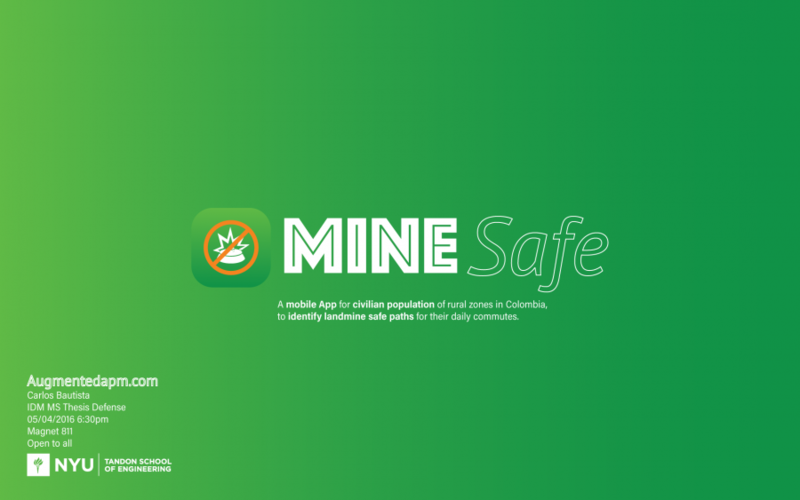 By developing Mine Safe: A mobile App for civilian population of rural zones in Colombia, to identify landmine safe paths for their daily commutes. This project aims to understand the state of the art of the current technologies for humanitarian demining in Colombia as a medium to generate relevant technological applications to contribute to the humanitarian demining process for both civilian and military population. Research is intended to reach new conclusions in certain topic, in the particular case of this paper these conclusions seems to be more questions. 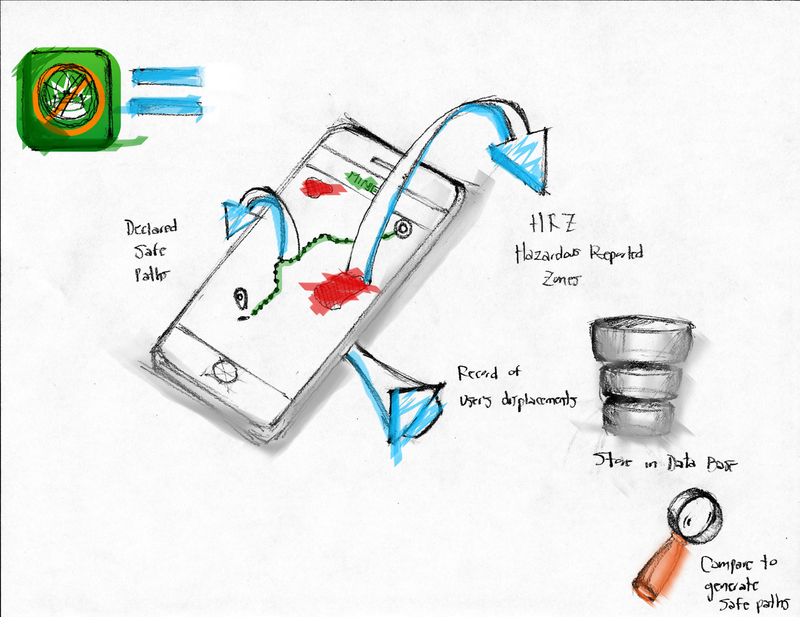 How can the ability to divert/avoid land mines become more accessible to the public? Was the original question that gave origin to this work. Since this question has not been resolved yet. There are some clues on how to tackle this issue by using information and delivering this information to the public to gain accessibility and build accuracy. Tools developed during this process are intended to deliver information to the population of rural areas regardless their social status or other considerations that might limit the access to technology. These issues can be tackled by establishing international Cooperation between both private and public organizations. 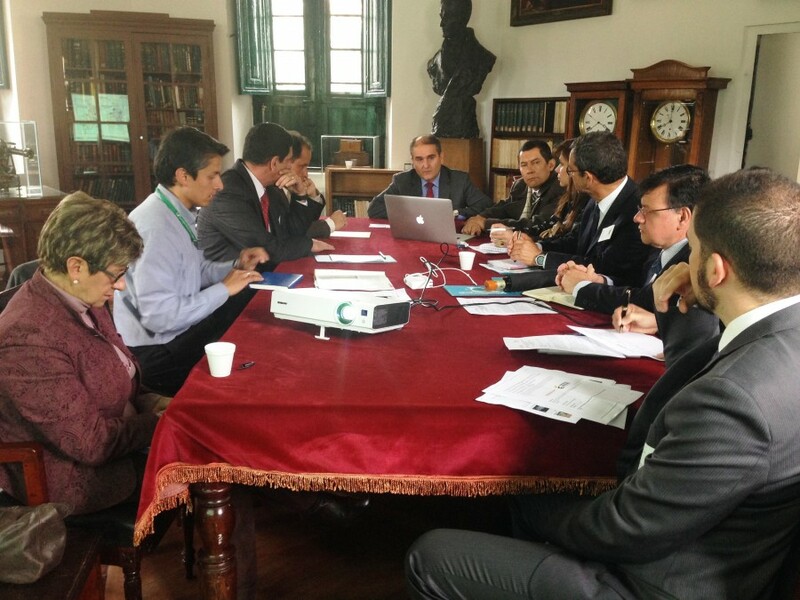 For instance the collaboration established between the Colombian government and Academia through the Scientific and Technical Committee illustrate how this relationship can be take to the next level by strengthening and encouraging joint investigation. Next steps for this project will be definitely attached to collaboration between Academia, Public Sector, Private Entities, Researchers, NGO’s and of course the Colombian Population. Furthermore as the landmine issue is not an isolated situation this project could be extended and adapted to another countries such as Afghanistan, Angola and Iraq among many others were landmines remain an active issue. Confirmed Skype meeting with the Colombian Government for Monday Feb 29th. Defining the app functionality was a great asset. Need to gather the existing information from halo trust.